Tennisons - about us, who we are and what we do! 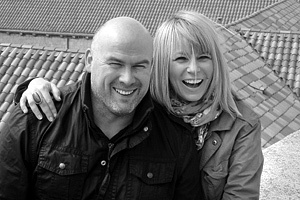 Tennisons was established in 2008 by Michelle and Ian, a husband and wife team based in Coventry and offering experience and professionalism in the field of photography, retouching and design. In 4 years it has gained a reputation as a trusted and contemporary wedding and childrens photographer. Many businesses, educational establishments and media outlets also choose Tennisons to deliver commercial photography as well as retouching and design work. Michelle Tennison has 17 years experience as a Press Photographer and for the last 3 years has been successfully operating as a freelance photographer covering all types of photography. Michelle travels extensively across the country undertaking PR and corporate work for many major media and communications companies. As the images on this website show, whether it's a wedding day, a birthday party or portraits of your family, Michelle can capture the moment in a contemporary and natural way giving you a lasting memory to cherish. If you have a question about how Michelle can help you with any form of photography please use the form on our contact page and your enquiry will be answered promptly. Ian Tennison is a professional retoucher and designer with 17 years experience. Ian has worked in many areas of design since studying Graphic Design at the Coventry Technical College after leaving school. His journey has taken in stints at the Coventry Telegraph as a paste-up artist and retoucher, and on to work for the prestigious Guardian and Observer newspaper and magazine publications as a high-end retoucher and quality controller. If you think Ian can help you with retouching or design please use the form on our contact page and your enquiry will be answered promptly.